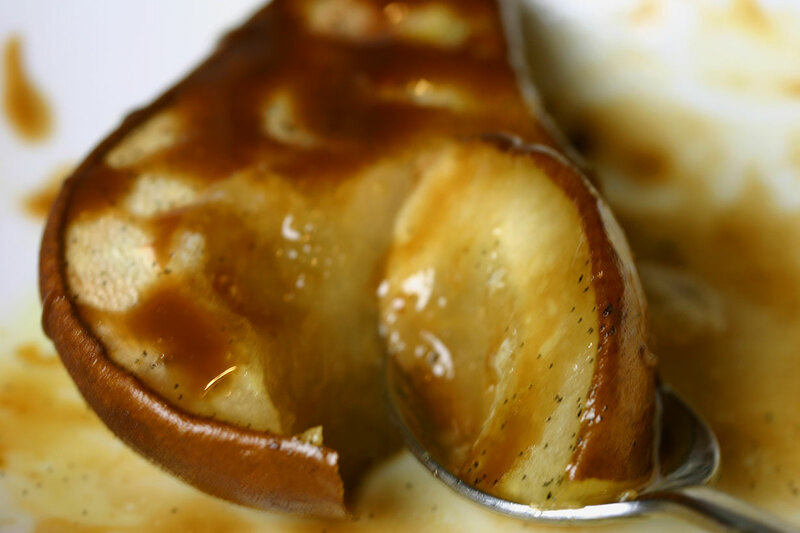 These roasted pears with warm butterscotch sauce pull off the clever trick of being both light and decadent. They also make the kitchen smell wonderful while they’re cooking. Until recently, I couldn’t have you the difference between butterscotch and caramel. But having Googled it, I now know that caramel is made with white sugar and butterscotch with brown. I am powerless in the face of this butterscotch sauce. If I’d had the house to myself while preparing it, there would have been so much tasting involved I may not have had any left to serve. Slice the vanilla bean in half. Scrape out the seeds and mix them with the caster sugar. Halve and core the pears, and brush the cut surfaces with lemon juice. Arrange the pears in a roasting tin, sprinkle with the vanilla sugar and dot with butter. Add the vanilla pod and a tablespoon of water to the roasting tin, put it in the oven and bake for about 30 minutes, or until the flesh of the pears can be easily pierced with a knife. To make the butterscotch sauce, melt the butter in a small pot over medium heat. Whisk in the brown sugar, double cream and salt and bring to a boil. Lower the heat slightly and cook for about five minutes, whisking occasionally. Remove from the heat and stir in the vanilla. If making the sauce in advance, reheat it gently before serving. Store any extra (ha!) in an airtight container in the fridge. I have three words for all Ten More Bites followers: Make. This. Now.